Description: Social networks have become a big part of today's online landscape. This is true for professionals as well. LinkedIn is a social network that allows professionals to find out more and interact with others whose needs or services align with themselves. This article will show how we can integrate this resource with leads in SalesLogix to show our SalesLogix users as much information about our leads as possible and will provide a complete sample for integrating LinkedIn with SalesLogix leads. Social networks have become a big part of today's online landscape. This is true for professionals as well. LinkedIn is a social network that allows professionals to find out more and interact with others whose needs or services align with themselves. This article will show how we can integrate this resource with leads in SalesLogix to show our SalesLogix users as much information about our leads as possible and will provide a complete sample for integrating LinkedIn with SalesLogix leads. LinkedIn is a social networking site that, according to it's About LinkedIn page, LinkedIn's mission is to help you be more effective in your daily work and open doors to opportunities using professional relationships. It's basis is to help match you up with others, whose needs align with services you provide, create opportunities with other professionals, and to provide information about others in the LinkedIn community. Whether LinkedIn lives up to this or not, the fact is that there is useful information that can certainly add value to our leads in SalesLogix. Helping us to know more about them and make it easier for our SalesLogix users who work with leads to connect with them. 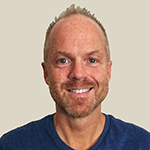 Credit for the idea of integrating leads with LinkedIn goes to Ryan Lowermilk, who posted an article about integrating LinkedIn with SageCRM (a 100% web-based CRM application) on his blog. Update the screen to show the number of results found and provide a click able link. We'll use a single hyperlink-style label for this, displaying the results in the caption of the label and place the URL we'll launch in the hint property of the label. We'll use XMLHTTP to programatically retrieve the HTML for the LinkedIn search results page. One cool thing about the code is that we'll make the call asynchronously so that the call to the LinkedIn site doesn't slow down the opening of the lead detail form. We don't want the form to take too long to load while it waits for the results from LinkedIn in the case of a slow connection or problems on the LinkedIn site. The way this will be done is we will use VBScript's GetRef function to give a pointer to a function in our script that XMLHTTP will invoke once the process is complete. This will "simulate" a threaded call inside of VBScript and make our process run separately from the "loading" of the lead detail form. One more thing to mention about doing this from SalesLogix. Even though your login for LinkedIn is remembered when you go to the site from a browser, this won't be the case for our code in SalesLogix. We'll need to initiate the login from SalesLogix so that it is associated with the application and we'll have our own cookie. To do this, I used a hidden browser control on the lead details. 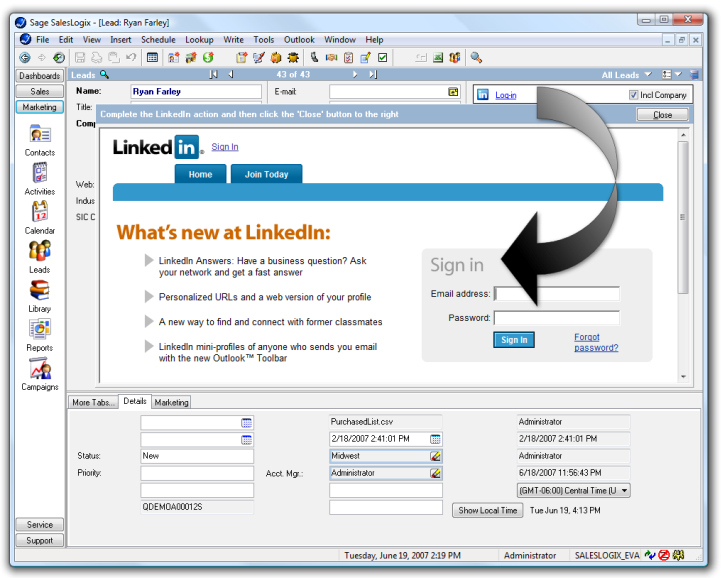 If a login is needed I show the browser and load the login page in it for the LinkedIn site. After the first time the user logs in from the embedded browser in SalesLogix, they'll be automatically logged in every time after that. lnkGotoLinkedIn.Caption = "Retrieving LinkedIn status"
lnkGotoLinkedIn.Caption = "No matches found"
lnkGotoLinkedIn.Caption = count & " LinkedIn matches found"
lnkGotoLinkedIn.Caption = "Error processing LinkedIn status"
If the user is not logged into the LinkedIn site, we invoke the embededed browser to allow the user to sign-in. Once the user has done this we'll have a cookie for the site and will be automatically logged in from then on. The sample LinkedIn integration bundle (for v7 only, no leads area in prior versions) that accompanies this article (see related section below) provides a more or less complete view of matching up SalesLogix leads with LinkedIn results. This article shows a few different topics for developing in SalesLogix. The use of XMLHTTP and screenscraping, which certainly could be used for other integrations as well, and making an asynchronous call to retrieve the HTML ressults of the search. 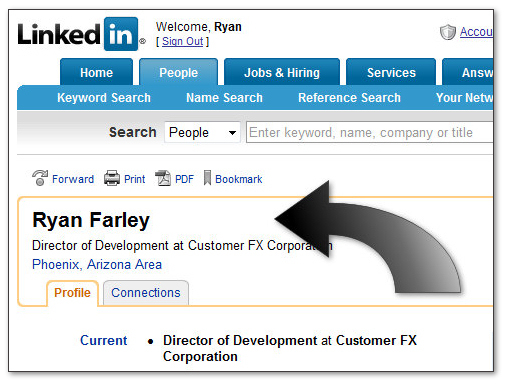 Best of all is the integration with LinkedIn to make your SalesLogix leads more meaningful. Added it to a test system.. and Immediately added it to the Production Slx system! Hi Ryan - cool stuff. Just one question about using it with IE7. Every time you click it opens another instance of IE instead of using tabs. Actually it would be even better if it knew that there was already a window pointing to the linked in site - but that is probably mor difficult to manage. Is there anything to make the link "tab aware"? Brilliant to have this info within SLX. Can this also be added to the main contact screen as well, or only within the leads section? Also, due to a more open API since this code was submitted, would it now be possible to actually import any of the contact details from LinkedIN into SLX?